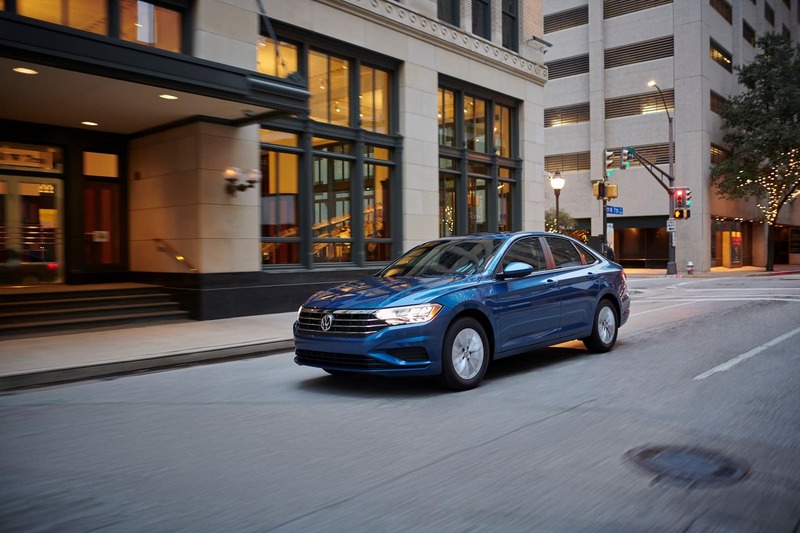 Spacious, sporty, and loaded with turbocharged performance, drivers in search of a sedan that possesses all these qualities should look no further than the 2019 VW Jetta and Subaru Impreza. Inside, you’ll find newly designed interiors that place a premium on comfort, while their intelligent engineering delivers a custom driving experience each time you step behind the wheel. At Volkswagen Lee’s Summit, we’re dedicated to helping drivers throughout North Town, Overland Park, and Mission, KS, find the perfect vehicle to match their lifestyle. To do that, we compared the Volkswagen Jetta vs. Subaru Impreza in a number of important areas: performance and efficiency, design and tech, and active safety. Continue reading to see which vehicle comes out on top! With distinctive VW engineering to fit your driving style, the 2019 VW Jetta is a small sedan that provides a performance-inspired 1.4-liter turbocharged engine, producing 147 horsepower with 184 lb-ft of torque. Its optional six-speed manual or eight speed automatic transmission with Tiptronic® provides a nimble ride when overtaking vehicles on the highway or maneuvering busy city streets. Its standard front-wheel drivetrain provides four separate driving modes when paired with the available Driving Mode Selection feature, including: Eco, Normal, Sport, and Custom. If precision-handling lists high on your priorities, you’ll appreciate the intelligent XDS® Cross Differential System, available on the R-line trim. Meanwhile, the Subaru Impreza comes equipped with a 2.0-liter four-cylinder engine that is capable of reaching the 147-horsepower range and provides up to 145 lb-ft of torque. It comes standard with a five-speed manual transmission or available Lineartronic® Continuously Variable Transmission. Handling is assisted by an active torque vectoring system, along with vehicle dynamic controls that help provide a smooth ride when traveling around sharp bends and curves. Among their many benefits, fuel efficiency is often a major consideration when choosing a small sedan model. In this area, the 2019 VW Jetta performs especially well with an EPA-estimated 30/40 city/hwy MPG*. This makes the VW Jetta not only a great option for the daily commute, but also a true long-distance hauler. For its part, when paired with its Continuously Variable Transmission, the standard Impreza 2.0i trim receives an EPA-estimated 28/38 city/hwy MPG. You can expect an EPA-estimated 24/32 city/hwy MPG when paired with its standard manual transmission. Plus, two-tone V-Tex leatherette seats that come with available heating and ventilation, offer supreme comfort on those chilly mornings. Both Volkswagen and Subaru place your safety above all, each model containing a full suite of active safety features to help keep you out of harm’s way. The 2019 VW Jetta offers a full line of safety features, including: Electronic Stability Control, Anti-Slip Regulation, Electronic Differential Lock, Engine Brake Assist, Anti-Lock Braking System, Electronic Brake-Pressure Distribution, and Hydraulic Brake Assist. Likewise, the Impreza comes standard with things like: four-wheel antilock braking system, daytime running lights, and a brake override system. Which Vehicle is the Right Choice for You? While it’s clear that both sedans offer remarkable performance, fuel-efficiency, design, and safety, it’s clear that the 2019 VW Jetta is the choice between the two models. If you’re a driver near North Town, Overland Park, or Mission, and are interested in taking a closer look for yourself, visit us at Volkswagen Lee’s Summit or go online to schedule a test drive today!